World Boxing Organization cruiserweight champion Enzo Maccarinelli (28-1, 21 KOs) destroyed previously unbeaten challenger Mohamed Azzaoui (22-1, 8 KOs) in the 4th round on the undercard of the Calzaghe – Kessler fight at the Millennium Stadium, in Cardiff, Wales. In the fourth round, the six foot four inch Maccarinelli landed a crushing body shot to the left hip of Azzaoui, sending him crashing to the canvas in a ball of pain. Though he tried to get up, Azzaoui was in far too much pain to get to his knees and was thus counted out at 0:58 of the fourth round by referee Dave Parris. In the first round, Maccarinelli mostly jabbed, using his long reach and fast hands to keep Azzaoui bottled up on the outside where he was unable to get within range. However, Maccarinelli got a little sloppy at one point and came charging forward, flailing his hands and was hit with a perfect left counter by Azzaoui. From that point forward, Maccarinelli was much more careful, content to win the round with his jab. 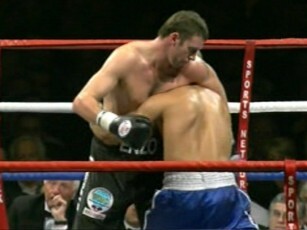 In the 2nd round, Maccarinelli continued with his jabbing. However, shortly into the round, he landed a devastating left hook to the body, which clearly hurt Azzaoui, sending him backwards in full retreat. For the remainder of the round, Azzaoui looked frightened to mix it, seemingly not wanting to get hit with another one of Maccarinelli’s trademark crushing body shots. Late in the round, Maccarinelli landed another huge left hook to the ribs, though it wasn’t quite as effective as the first shot, it still appeared to hurt Azzaoui. In between rounds, Azzaoui remained standing, opting not to sit down on his stool, perhaps due to the effects of the two body shots that Maccarinelli hand landed in the round. In the 3rd round, Azzaoui landed several good right hands which landed cleanly to the head of Maccarinelli. However, the punches had no effect nor did they slow Maccarinelli down as he continued wading forward. For his part, Maccarinelli spent most of the round measuring Azzaoui and trying to set him up for a left hook. However, Azzaoui skillfully avoided getting hit with any meaningful body shots and escaped the round without any further damage. In the 4th round, Azzaoui came out on the attack, immediately landing several right hands. A short while later, Azzaoui trapped Maccarinelli up against the ropes and attempted to land a flurry of punches. However, Maccarinelli ducked the shots and spun off the ropes and fired off a right to the head, barely grazing Azzaoui, and then a left hook to the left hip that sent Azzaoui down to the canvas. Boxing » Enzo Maccarinelli » Maccarinelli stops Azzaoui in 4th round KO!